Flying Finn Tapio Laukannen has been tipped for back-to-back success this weekend when top drivers prepare to traverse technical stages in Elgeyo Marakwet and Uasin Gishu counties. Laukannen hopes to chalk up his second successive victory in Saturday's KCB Eldoret Rally and consolidate his lead on the Kenya National Rally championship log. Multiple former Kenya National champion Baldev Chager candidly admittedly that Laukannen has set the standards so high that locals really have to try and catch up time and time again. "And every time anyone tries to catch up with him (Tapio) they pull away again. Well, I don’t really know where his limits are or how much faster he can go still from what he is doing. The good thing is he has really made us Kenya boys wake up. I think generally everybody has started driving faster just to get closer to Tapio more than anything else," said Chager. Asad Khan 'Kalulu' who finished third in Eldoret a decade ago described Laukannen as a superman and the man to beat currently on the KNRC front. "He is a very good driver having already won championships back home Finland and Britain. He is simply WRC material and has swept the ground with all and sundry whenever he had a good run," said Khan. Laukannen led from start to finish in Eldoret last year to restrict youngster Rajbir Rai to second position. The Flying Finn in his crowd pleasng Subaru Impreza GVB13 R4 has won three of five events held so far. 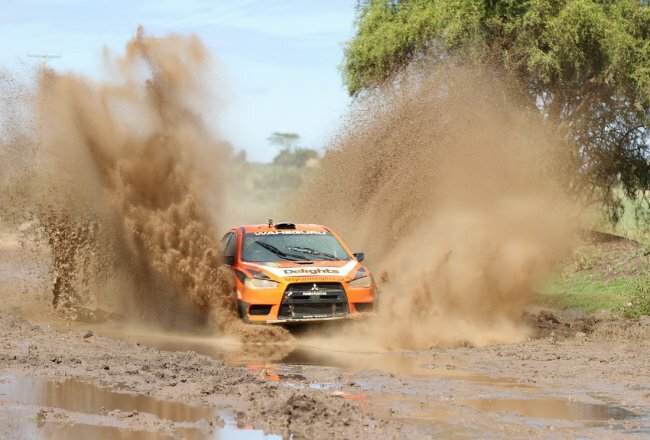 He clinched the season opener in Kajiado, Wundanyi Rally and the last one in Nanyuki. Chager emerged the victor in Kisumu with champion Jaspreet Chatthe clinching the coveted Safari title when Laukannen suffered a mechanical problem. Laukannen enjoys a four-point cushion over Chatthe who is incidentally the African champion. "We have to keep on pushing as any slight mistake will see Chatthe cling to the title,' Laukannen added. Meanwhile, Chager aka Flying Singh believes he has come to grips with the new Mitsubishi Lancer Evolution10 R4 car which is an improved version of the Group N he has driven for more than two seasons. "We are not doing too well on points as we haven’t finished two events this year. So the essence for us is to go out there and do the best we can. I’m quite happy we gave the new car a finish at least in the last rally. We were fighting for second at the time we got punctures right at the end and finished 5th, but that’s rallying. So we look forward to approaching Eldoret with the new car, it’s quite enjoyable now, getting the feel of it more and more.," said Chager. Chager is also happy that he has not had any teething problems with the new car thus far. "Safari retirement was as a result of a rock in the intercooler. Voi was entirely my fault when we fell down that ravine. Last rally it went spotless. Our boys have prepared it really well and its just up to the driver," said Chager. The rally co-sponsored by Liquid Telecom, Toyota and Red Bull will be flagged off outside KCB Eldoret branch on Uganda road at 7 a.m. on Saturday after which cars will tackle stages near Eldoret as they head towards the home of champions in Iten. Governors Alex Tolgos and Jackson Mandago will flagoff the event in Eldoret. The designated spectator stage will be centred on Chemweno in Moiben. This year's Eldoret rally has attracted two drivers from Uganda in Kepher Walubi and Duncan Mubiru "Kikankane". 1. Tapio Laukannen 104, 2. Jassi Chatthe 100, 3. Ian Duncan 72, 4. Rajbir Rai 61, 5. Carl Tundo 51, 6. Baldev Chager 49, 7. Onkar Rai 48, 8. Manvir Baryan 41, 9. Mahesh Halai 20, 10. Frank Tundo 16.